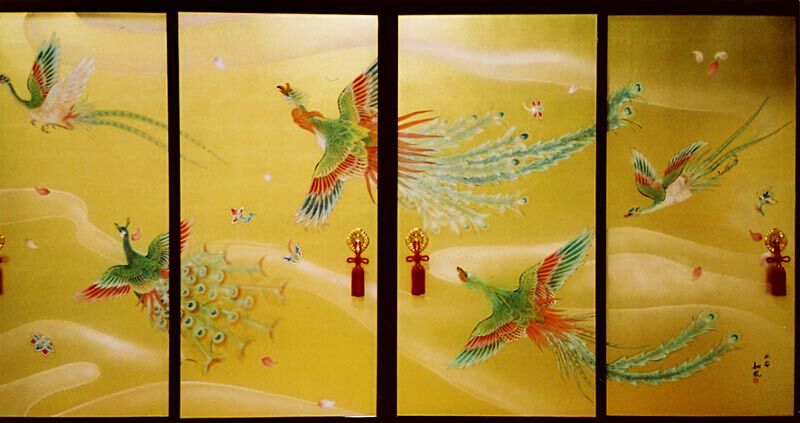 Fusuma doors are the crucial part of Japanese architecture for its utility and decoration. Its durability must be enough for daily use. 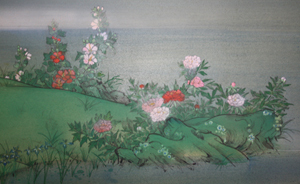 Fusuma paintings are mostly painted on rice paper, hemp paper, or gold paper. Among various papers, we are specialised in painting on gold papers. Located in Sapporo city, Kako-ji was formally build as a preaching station of Jodo-Shinshu Hongwanji sect in Shin-Kotoni, Meiji 29. The station was officially acknowledged as a temple in Meiji 38. In Heisei 7, Kako-ji rebuild the main temple and other buildings for its 100th anniversary of preaching. 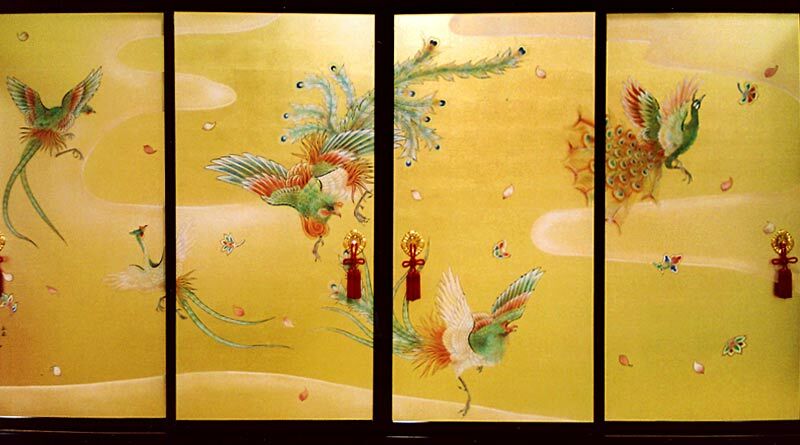 We painted 5 phoenix and peacock on each side of fusuma panels in the main temple. Taking the word "king" from the name of the temple, we choose phoenix as the bird representing king's dominance and eternal piece. 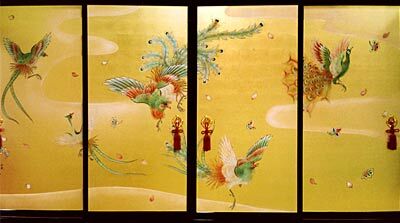 Along with phoenix, peacocks and other sacred birds and lotus flowers are painted to represent the bright skies of The Pure Land. Large partition at the entrance of Kinshoku-ji, Kibe school, Shinshu sect. 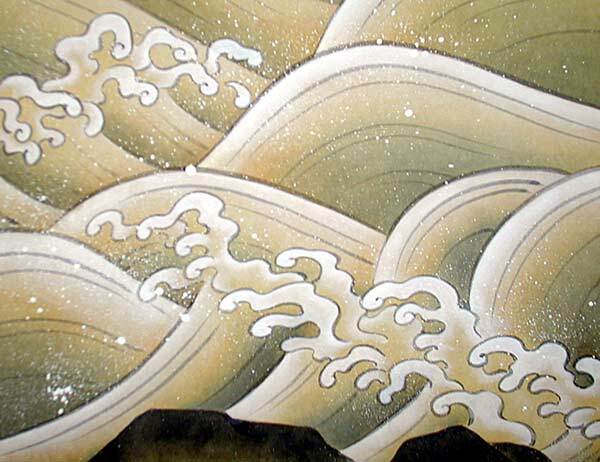 Painted by Nyofu Yasukawa, the head of painter of Kinshoku-ji. 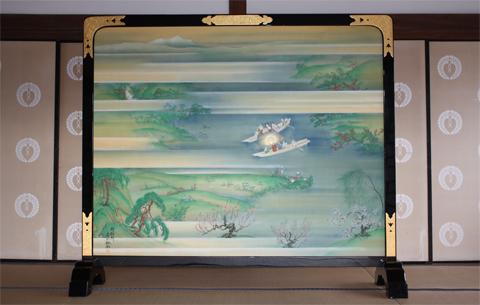 This partition was restored for the 750th memorial of Shinran Shounin, the founder of Kinshoku-ji. 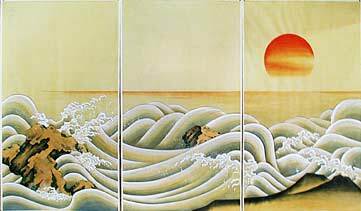 The original image was a ink drawing of a different picture. All parts of the partition was damaged over time. 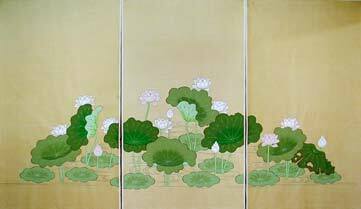 Due to restoration, we reproduced the painting to the Legend of Kasumiga-ura, which describes the history of the temple's principal image. Japanese lacquer and metal decoration of the partition was restored as well, spring back its new life. 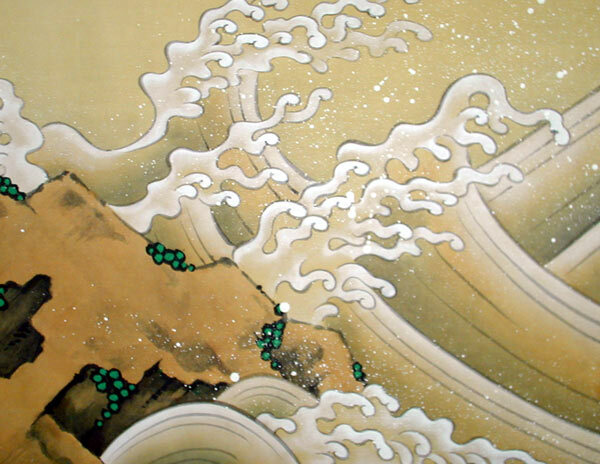 During his missionary to Kanto area, Shinran Shounin pulled out a statue of Amida in the lake Kasumiga-ura. On his way going back to Kyoto, Shinran Shounin placed the deity at Kinshoku-ji, which is the establishment of Kibe school. 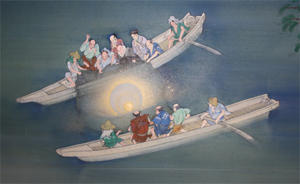 On the top of two boats in the middle of the lake, the person pulling up a web is Shinran Shounin. 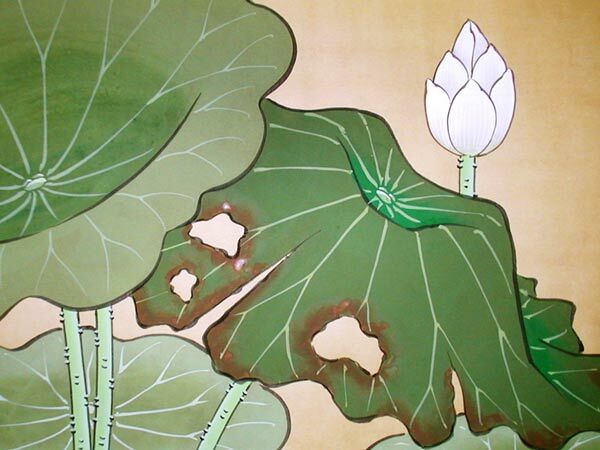 The gold paint caught in the web describes the halo of Amida.